Readers of a certain age might recall Fenton Bresler’s ‘You Be The Judge’ column in the Sunday Express, when it was still a broadsheet. Now, as an interesting alternative to the British Library’s re-publishing of classic crime stories, the Cold Case Jury Collection looks at real life crimes, the evidence, what the jury found and what alternative outcomes there might have been. While the principle might sound a tad intellectual and legal precedent-based, it’s anything but. 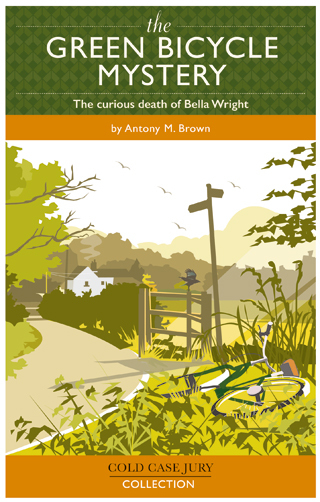 The Green Bicycle Mystery looks at the case of Bella Wright, found dead on a quiet, rural Leicestershire road in 1919. The case centred on a youngish, unshaven rider of a distinctive green BSA bicycle seen riding with Bella not long before she was found dead. Did that man commit the crime? And what was the significance of a crow found near by, covered in blood? The case was complicated by the police taking a long time to find that cyclist: Ronald Light, an ex-army officer who was a teacher when arrested, stood trial for Bella’s murder. The book narrates what happened to Bella as a crime story, but then differs from fiction by devoting the second part of the book to the evidence, providing not only diagrams of the murder scene but also notes of the court proceedings. It rounds off with the verdict, where author Brown gives his take on what he feels happened to Bella, and, most importantly, who he feels committed the murder. There’s also a chance for readers to have their say too, via a Cold Case Jury website. An interesting and original concept that’s both engaging and involving.